It looks like a BestBuy advertisement of T-Mobile launching a pre-paid BlackBerry service has been spotted, informs CrackBerry. 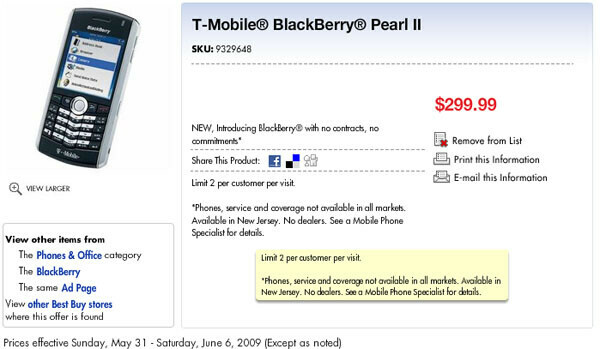 Customers are able to get a model, named the BlackBerry Pearl II (seems identical to the original Pearl) without long term commitments for $299.99. Well, this sounds great, having in mind that the Pearl is a really nice smartphone; the things is the ad says the service is available in New Jersey only. However, some users have said the pre-paid BlackBerry can be obtained in other states as well, so we guess the only way to find out is go out and check. Oh, and don’t forget to tell us if you manage to get your hands on any additional information! Hmm, hasn't blackberry service and blackberry handsets been available with flexpay already? I wonder what this is about. This is interesting. Orange UK annouced the prepaid Blackberry service in January 2009 I beleive. So this type of prepaid made it's way to the US. Interested to see how this will do with T-Mobile. And if any other carrier will offer the same service. I just got back from Bestbuy, this is what I was told, bestbuy will be offering tmobile's flexpay service, so it's not some new offering. It's just that bestbuy became a channel through which you can get flexpay.